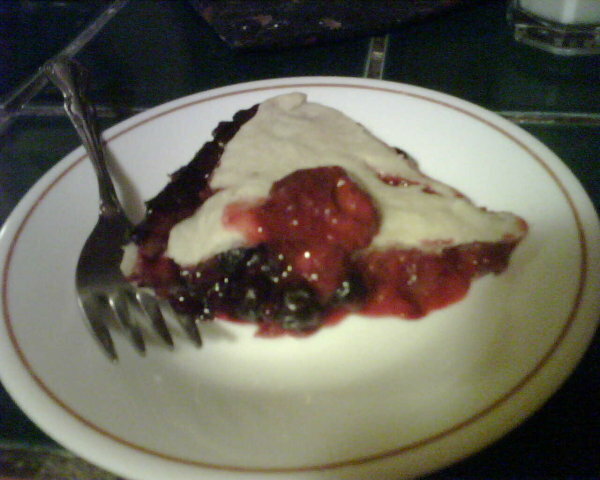 I made blueberry-strawberry pie today in honor of pi day. Tastiest sacraments ever. I used empanada dough instead of pie dough, and I like it a lot better. It’s easier to work with, too, since you can re-roll it and it won’t get tough. It’s fine-textured, and flakey in a different way than pie dough. I like the way it flakes better too. 1/4 C flour, 1/2 C sugar, 3-4 cups mixed berries, half a lemon’s juice. Stir until it’s a slightly mushy consistency. Kinda like oatmeal, only awesome instead of gross. 1 cup flour, 1 stick butter (cut in pieces), a quarter teaspoon of salt, blended well. Add a third of a cup of boiling water and mix until it forms a smooth, elastic dough. Roll like pie dough, but without the fuss and hands-off approach. Just go for it, the dough won’t even stick to much thanks to the butter melted through it. Bake at 350°F until the crust starts to crisp.